Whilst a botched dye job can leave many with months worth of bad hair days, it seems that the fashion for temporary hair colour is gaining followers. So much so that new research from Mintel has found that sales of temporary hair colour products have tripled between 2013 and 2014, growing from £1 million in 2013 to £3 million in 2014*. The trend looks set to give the hair colourant category some much needed highlights as overall sales of hair colourants in 2014 are predicted to have seen a decline in value of 5%, falling from £344 million in 2013 to an estimated £327 million in 2014. Declining sales have been particularly noticeable in the permanent hair colourant category, which fell from £282.4 million in 2013 to £266 million in 2014, as well as the semi-permanent colour category with sales dropping from £8.1 million to £7.1 million in the same time period. Whilst over a third (37%) of Brits have used hair colour themselves at home in the past year**, of these one in 10 (11%) have used new colour techniques, including hair colour and chalks, rising to over a quarter (28%) of 16-24’s. Usage soars amongst men with a third (33%) of those who have used hair colour at home in the past twelve months using a new colour technique, compared to just 5% of women. “New colouring techniques such as hair chalks appeal to young people, allowing them to follow current fashion trends and the rising popularity of temporary colour products show a consumer desire for flexibility to change the colour of their hair as they wish. The high usage of new colouring techniques amongst men shows that they are taking greater pride in, and take a greater confidence from, maintaining a well-groomed appearance whilst experimenting with new and different products.” Roshida added. 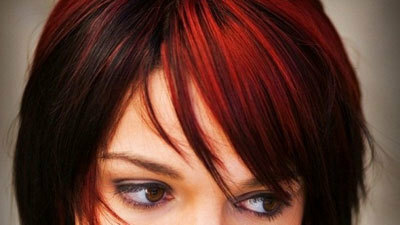 Mintel’s research has also found that young men are unafraid of streaking ahead when it comes to hair dye. Indeed, a third (33%) of men aged 16-24 have coloured their hair in the past year themselves, compared to an overall average of 16% of men. In addition, some 12% of men aged 16-24 have used permanent hair colour and 11% have used semi-permanent hair colour at home in the last year. Further to this, Mintel’s research has found that young men are more likely to have grey hair than young women. Over a quarter (28%) of men register some level of grey hair compared to less than one in five (18%) women of the same age. Suggesting the onset of ageing, grey levels jump amongst those aged 25-34, whilst 23% of UK adults aged 16-24 claim to have any grey in their hair, this jumps to almost half (44%) of 25-34’s. “It may be that grey hair on men is only acceptable after a certain age, which may drive younger men to use haircolour, whereas older men are less likely to. Additionally, young men may be more likely to want to follow fashion trends.” Roshida continues. Finally, whilst younger consumers are embracing temporary colours, Mintel’s research has found that it is over-55’s that are dyeing to go blonde. Of all Brits who have coloured their hair at home in the last year, a third (33%) of 16-24s use black-to-dark brown shades for all-over colours, compared with just 6% of the over-55s. Older people are more likely to use lighter shades, with 20% of the over-55s using light brown-to-dark blonde, compared with 11% of 16-24s and 43% using any medium blonde-to-lightest blonde compared with 15% of 16-24s.